Welcome back to the Comic Book Herald reading club. This week we read Jeph Loeb (current Marvel head of TV, and longtime comics scribe) and Tim Sale’s “color series,” including Daredevil: Yellow, Spider-Man: Blue, and Hulk: Gray. As always, you can see what the rest of the CBH club is saying in our club forums, and you can always provide suggestions for what you’re most interested in reading next (or just for the reading club in general). Additionally you can view past week’s reading, if you missed a previous book. You may recognize Loeb and Sale from their highly lauded Batman work, the series some lunatics are calling the best Batman starting place in comics. I’m personally a big fan of Batman: The Long Halloween, and Batman: Dark Victory, so if you enjoyed these Valentine’s Day “Lost Loves” from Loeb and Sale, I highly recommend crossing into the DC Waters (heathen! Blasphemer!) for some Batman. You could also do the same for their work on Superman: For All Seasons. Marvel has had a lot of love interests over the years, although it’s debatable how many real love stories have been told. There are some great selections – Spider-Man Loves Mary Jane for example – but try to think of the best love stories, or relationships in Marvel history and you’ll likely net out on the tragic death of the love interest. Loeb and Sale cover Karen Page, Gwen Stacey, and Betty Ross, but we can also look to Jean Grey, Sharon Carter, Mockingbird, and undoubtedly a whole stable of other unfortunate victims. Think about it long enough and you realize Marvel has a troubling propensity to kill off the women in our heroes lives. Are there any long lasting relationships in the Marvel Universe? Even one? Aside from Sue & Reed Richards, and now Jessica Jones and Luke Cage, it’s a challenge to point to successful marriages. Which leads to a theme we see recurring in Daredevil: Yellow – if Karen Page had never met this costumed hero, might she still be alive? This is a formative theme in Spider-Man comics since the Death of Gwen Stacy. His great power begets great responsibility which begets unspeakable tragedy which ultimately leads to something… amazing. I’ll admit, you can’t have Spider-Man as we know him today – burdened with an unrelenting supply of guilt-fuel – without the Death of Gwen Stacy. Could you have Daredevil without the death of Karen Page? In some ways yes, but in many ways no – we don’t get Frank Miller’s Daredevil: Born Again without the “loss” of Karen Page, and in many ways this is similar to the death of that bright, beautiful young secretary we see in the pages of Daredevil: Yellow. Given that these losses sparked such great, essential comics for the heroes, it’s difficult to argue they were unnecessary or a mistake. Nonetheless, it all just seems so… anti-heroic. Who are these heroes of ours protecting if not their loved ones? To Loeb’s credit, he doesn’t respond with anger or rage from Daredevil and Spider-Man, instead choosing heartfelt nostalgia. At their strongest, Yellow and Blue are extremely effective views on the loss of a loved one, celebrating their memory, embracing the sadness of their departure, and remembering them at their best. These pages are drenched in nostalgia, and for long time comic fans, it’s a refreshing blast from the past. 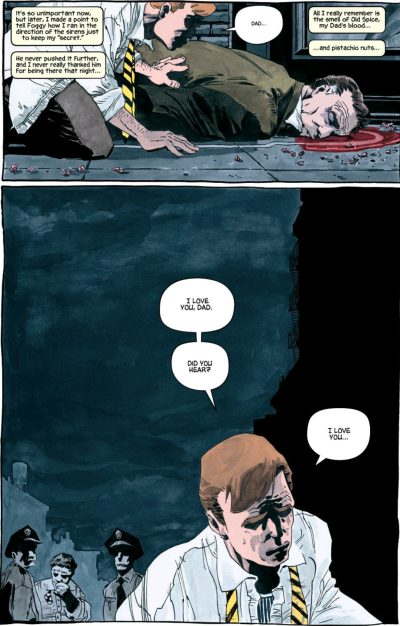 Tim Sale’s distinctive style captures the retro flashback perfectly, as Loeb’s narrative devices all provide perfectly convenient excuses for the heroes to look back so thoroughly. For me, Spider-Man just needing to talk to Gwen through a tape recorder (“Is this thing on?”) is the most effective, and heart wrenching. If you’re a newer Marvel fan, these comics do a very nice job highlighting the heroes origin stories. Daredevil: Yellow sums up Daredevil #1, #2 (Electro), #3 (The Owl), and #5 (Purple Man) with a nice flourish. 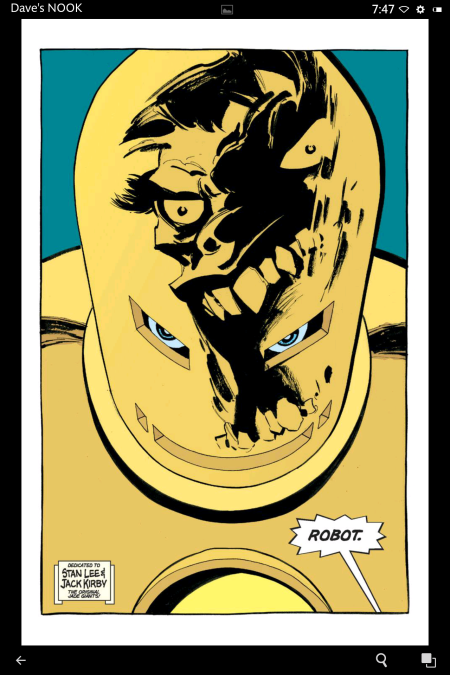 Yellow is true to Daredevil’s origins, the way Lee & Wood intended. When I first read the color series earlier in my Marvel fandom, I found Daredevil: Yellow and Spider-Man: Grey the most affecting by far. These are such nostalgic, heart-on-the-sleeve looks back at iconic, tragic moments in the heroes’ lives. Rereading the books this week, I was surprised to find that Hulk: Grey felt the most of-the-moment and interesting, while Yellow and Blue had grown somewhat overly sentimental. Hulk: Grey on the other hand is a different monster entirely. 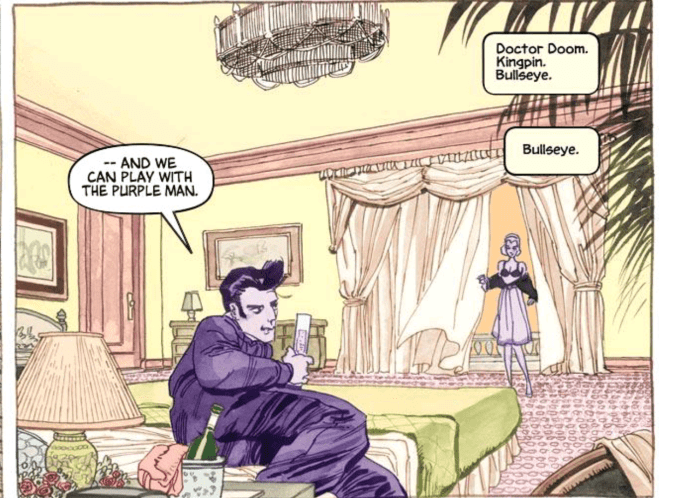 Loeb’s narrative technique of choice is an on-the-run Bruce Banner needing to meet with psychiatrist Dr. Leonard Samson (on Valentine’s Day of course). Banner shares his origins and how it all connects to Betty, the now gone love of his life. The series begins in the same manner as Yellow and Blue, with a nostalgic look back at this amazing woman. 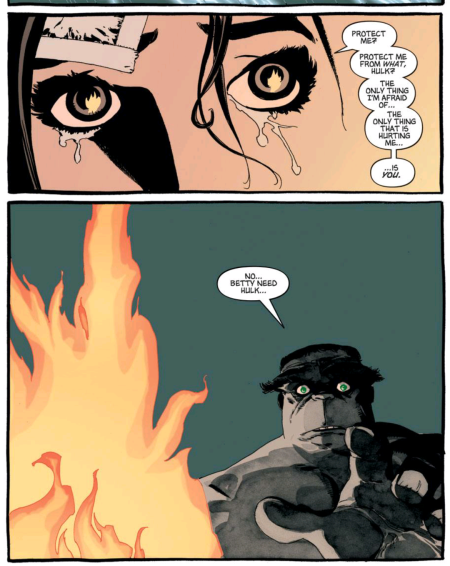 Hulk: Grey takes a sinister turn though when it’s revealed that Hulk hit Betty in a fit of rage. The pure-hearted, unassailable love of Daredevil and Spider-Man is inverted into a haunting smash of domestic violence. 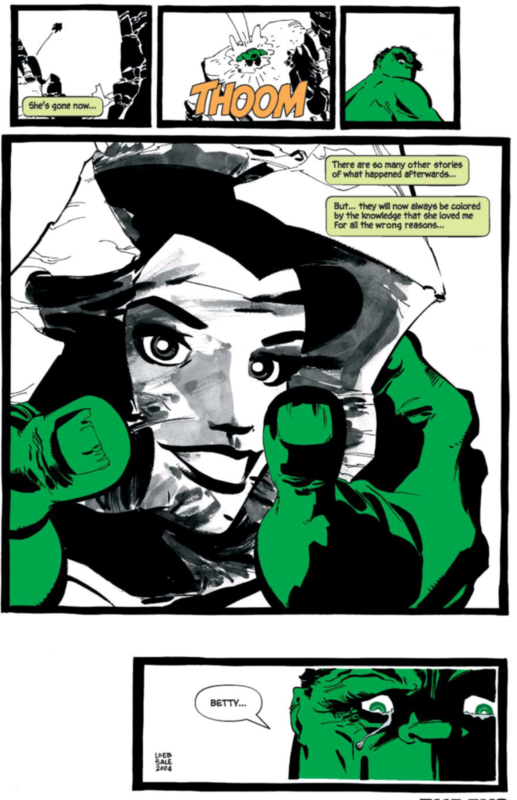 Given how prevalent a problem domestic violence is in the national media these days, I was particularly taken aback by Loeb and Sale’s commitment to the theme that the Hulk (and possibly Banner) is in fact a monster. This is one of the oscillating standards of the Hulk’s existence; he’s a lovable monster who just wants to help, he’s a mindless beast who only destroys, he’s a righteous warrior who just wants justice. Loeb and Sale use the Hulk’s brute, violent nature to follow through on the evil nature of Dr. Banner’s Mr. Hyde persona. Unlike, Daredevil and Spider-Man, you don’t leave Hulk: Grey feeling good about Banner and Betty. Loeb’s final turn is to indicate that Betty accepted Bruce (and in effect accepted being a victim) because that’s what General Thunderbolt Ross, her father, had conditioned her to understand. Bruce’s haunting self revelation is that he’s every bit the monster he’s accused Ross of being. It’s a troubling love story, with much deeper implications than I’m capable of grasping. Nonetheless, I can certainly identify that there’s a darkness to this love story that is vividly unsettling, in very much the same way that Mark Millar and Bryan Hitch’s Ant-Man and Wasp relationship in Ultimates. The darker theme, while complicated, is certainly the most provocative of the three series. This could be a part of why Sale’s art is so strong here as well. As readers noticed in the forums, Sale takes to the Hulk much more naturally than Spider-Man. Based on his Batman work this is somewhat unsurprising, as Sale also draws one of my all time favorite Solomon Grundys. There are some stunning examples of Hulk art here, from the monstrous to the simple, for example a lone Hulk eye peeking through the door hole of Betty’s home. These three series provide reasonably effective insight into where Daredevil, Spider-Man, and Hulk stand at the turn of the century. In order, Daredevil is reeling from the loss in Kevin Smith’s “Guardian Devil” story arc, Spider-Man is in a relationship with Mary-Jane Watson, and Dr. Banner is on the run from the law. All in all, I think each series captures the essence of the character very well. For Daredevil, it’s his father’s death, and now Karen’s, that spur him onwards, to be the swashbuckling hero in the face of so much hardship. For Spider-Man, it’s always being the hero, always being responsible, even he’s at his lowest, and life is at its hardest. And for the Hulk, it’s that there’s a monster in Banner that he’ll never be able to atone for, the best he can hope for is the choice he makes next. Naturally, there are all sorts of additional details we’ll fill in to a certain degree as we progress, but in addition to the Valentine’s Day connection, it was my hope that the color series would provide a nice bridge from character origins to the modern Marvel era. If you want to go back and catch up on the backstories for these series, I’ve highlighted some recommended reads below. If you’re truly feeling ambitious, you can always start from Amazing Spider-Man #1, Daredevil #1, and Incredible Hulk #1, but my suggestions are a little more expedient. I had originally intended one more look back at Marvel history before progressing to the Marvel Knights era, but I’ll be honest, I’m getting reckless, and honestly, 8 issues of Avengers Kree / Skrull War doesn’t feel right (no matter how essential). So… let’s get this party started. We’ll be starting to work through my Complete Marvel Reading Order, and we’ll be doing that with one of the comics that got me into comics: Amazing Spider-Man #30 to #35, & #37 (1999 – 2013 series).